This week is the Consumer Electronics Show (CES) where I spend a good 5 days away from home working our AT&T Developer Summit and seeing all of the geek goodness the world’s largest gadget show has to offer. Unfortunately, for my wife she gets 4 days solo of getting our boys ready for school – not an easy task. Plus her chef is away from the house. As way to cushion the blow of being gone, I make a couple meals to get her through the week. The request this time was a double-dose of chili. Stephanie enjoyed the last time I made Emily Levenson’s Embelly White Chili and wanted that, but she also wanted a more traditional vegetarian chili. For the vegetarian chili, I browsed Pinterest, the latest social networking site that is a great visual way to share content. The site has a Food & Drink category and you can follow my “Mostly Vegetarian” board as I use it to tag future recipes. 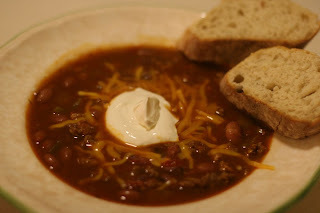 I found a Three Bean Chili from a blog I wasn’t aware called The Wright Recipes, by a former editor of Martha Stewart’s Everyday Food magazine. The first step is to dry char Poblano chilies, garlic and an onion. This technique uses no oil or butter in the pot, just medium-high heat and some turning to get a charred result. Then the chilies, garlic and onions are put in a blender with a pint of grape tomatoes and pureed. The puree is then added to some spices, brown sugar, and oil that is heated briefly. The combined puree and spices form the basis for the chili. Two cups of water is added along with three types of beans. I use Eden Organic canned beans since they are also BPA free-lined cans. A proper chili starts to take shape and heated to a simmer for 30 minutes when some frozen corn is added for the final 2 minutes before serving. I tried some of the chili and it is full of flavor unlike most vegetarian chilies that taste like vegetable soup with chili powder. However, next time I’ll reduce the Poblano chili number from 2 to 1 as this chili is very spicy. Great, but too spicy for my wife and bordering on too spicy for me too. We had stopped by our favorite locally focused grocery store, Urban Acres, and bought some sweet potatoes. What we did not expect was what kind of sweet potato. Apparently the Japanese Sweet Potato is a white, creamy potato that is very sweet. It has a smooth texture and tasted amazing in a vegetarian curry dish I made. While looking for more recipes to use sweet potatoes in, my wife follows a good vegetarian blog. Emily Levenson’s blog has a post with the most amazing scones that just happen to be vegan. We wanted to try another recipe, this time a vegan soup. For the Embelly White Chili recipe and other great cooking adventures checkout Emily Levenson’s food blog. So here is my take on Chili. Hope you enjoy it. If you like your Chili really spicy, make sure you increase the cayenne pepper and switch the sweet and mild peppers to hot pepper choices. The recipe below is spicy, it’s what I would consider “medium” spicy or “mild” for those who enjoy eating the hottest hot sauce around. Prep: 25 min. Cook: 1 1/2 hrs. 1. Cook beef, onion and garlic in 3 quart sauce pan, stirring occasionally, until beef is brown, drain. 2. Stir in remaining ingredients except beans, breaking up tomatoes. Heat to boiling; reduce heat to low. Cover and simmer 1 hour stirring occasionally. 4. Remove cinnamon sticks. Serve.